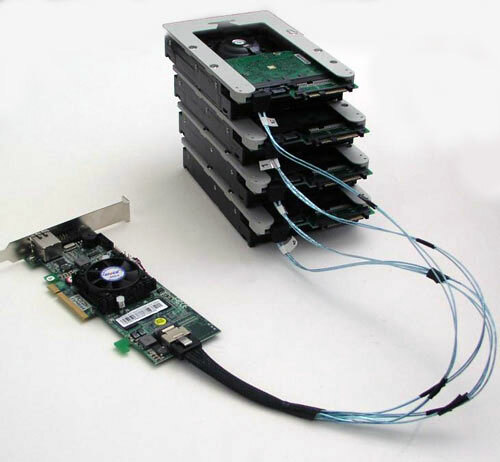 The 2009 Apple Pro RAID card for the Nehalem Mac Pro is ingeniously designed to trigger takeover of the four internal drive bays without the use of a mini-SAS cable connection. Cool technology but it effectively locked out the use of third party SAS and SATA host adapters with internal mini-SAS or SATA ports -- until now. Note that at 90% capacity, some storage solutions slow down considerably while others remain at the same speed. QuickBench has a Random Standard Test that uses small blocks (from 4K to 1024K) to measure random transfer rate. We average 5 runs. DiskTester's "run-random" test measures how many 4K transfers can be made per second in random locations across the whole volume. 1. We were able to demonstrate an inconvenient truth: The Apple Pro RAID card is not as fast as the alternatives. It's not that the 2009 Apple Pro RAID card for the Nehalem Mac Pro isn't a quality crafted host adapter, but for $700 I expect it to exceed 553MB/s with four very fast drives in RAID 0 mode. All three HighPoint RocketRAID host adapters we tested handled large sustained transfers faster than the Apple Pro RAID card. The Apple Pro RAID card was also beat on small random transfers with the exception of the low end RocketRAID 2680. The RocketRAID 4320 (and sister 4322) is a powerful RAID card. Connected to eight 15K SAS drives in previous tests, it peaked at 1200MB/s. 2. SSDs, as expected, are faster than the 15K SAS HDDs. The Apple Pro RAID card didn't accept the OCZ Vertex SSDs installed in the factory bays. We're not sure why but, again, they would have been limited to 553MB/s max. 3. The Apple Pro RAID card disables write caching (default) until the battery was fully charged (12 hours). The 2009 model now gives you the option to write at full speed while the battery charges. The RocketRAID 4320/4322 has a battery backup option rather than making it standard equipment. If you have a good UPS, you don't need it. 4. The MaxUpgrades "bypass" sleds (aka Backplane Attachment) are a clever workaround to the Nehalem Mac Pro's lack of an internal mini-SAS connector. Without this kit, you only have one choice for internal hardware RAID: the speed limited Apple Pro RAID. The photos below show the custom sleds with the bypass adapter and show how they connect to a third party RAID host adapter. Not knowing there was a workaround, HighPoint removed the RocketRAID 4320, 3520, 3510, and 2680 from the Mac Pro product list on their website. We're hoping to persuade HighPoint to put them back on the product list now that MaxUpgrades has a solution. If you order the Apple Pro RAID card, please CLICK THIS LINK and search on "pro raid" using the store search box. It's a great way to support Bare Feats. since we earn a commission on each click-through that results in a sale. Order from Other World Computing. If they don't have it in stock I'm sure they will special order it. Order the "SAS/SATA Backplane Attachment" direct from MaxUpgrades. When you purchase Apple USA products, please CLICK THIS LINK. It's a great way to support Bare Feats. since we earn a commission on each click-through that results in a sale.